One of the smartest ways to pack for a holiday is to make sure you outfit build. 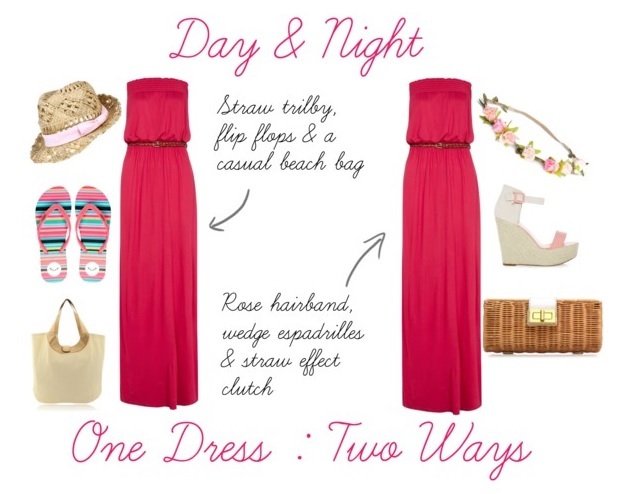 With the use of accessories one simple belted coral maxi dress can be worn for both day & night. The daytime look features casual styling, with a straw trilby, fun flip flops and a canvas bag for trips to the beach. I’m picturing this with beachy waves… beaut. To switch it up for night, scoop your hair up in to a high bun, and pop on a rosebud crown. Throw on a pair of wedge espadrilles and a cute straw clutch, and you’re ready for dinner, drinks & wherever the evening may take you. Do you outfit build when you’re packing for holidays? Which outfit do you prefer? How would you style this dress?